Legend has it, there are 13 Crystal Skulls scattered around Mexico, Central America and South America made of quartz crystal. The same quartz crystal used in making microchips which store unimaginable information and data within ! These skulls, found near the ancient ruins of Mayan and Aztec civilizations are a mystery as profound as the Pyramids of Egypt, the Nazca Lines of Peru, or Stonehenge. Some of the skulls are believed to be between 5000 and 36000 years old changing history as we know it ! Each of these crystals has been carved out of a single block of Quartz with no use of any tools such as to chisel out the skull. It's a smooth continuous piece of art offering no clue as to who made it and how was it made ! The Crystal Skulls carry light within which appear like chambers or passages, which make them glow bright even when in the dark as there is always some energy / light channeling through them. You can see a native american figurine, mysteriously embedded in the quartz. 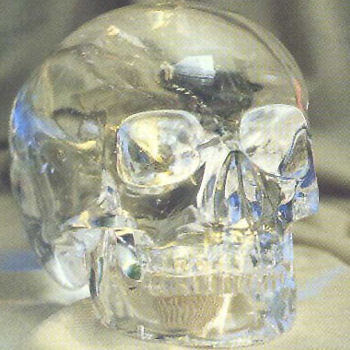 Some have seen a UFO in one of the Crystal Skulls. So neatly done, researchers have been heard saying, " This should not even exist " . The Mayan elders believe these were given to their ancestors by extra terrestrials from the Pleiades Star Cluster. 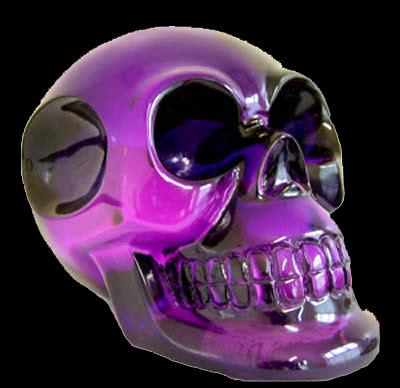 The Crystal Skulls possess a mystical connection with energies beyond the 3 dimensional reality. A legacy left behind by the great Mayan civilization the 13 Crystal Skulls are said to be portals of information to other worlds and will realign and connect with each other nearing the end time date in 2012. Know this that the end marks the end of a natural earth cycle which lasted 26000 years and not the end of the world. The end of the world as we know it, the end of time as we know it ! This change will be transient and shall give birth to a new species ... we are shifting from homo sapien to homo luminous .... we are evolving as light beings and this happening NOW ! How this change will crystallize is for each one of us to know as life unfolds with each chapter in time. What you think is what manifests ! Hosted by Lester Holt, SCI FI's investigative special Mystery of the Crystal Skulls will explore the history of these perplexing artifacts — the myths, the legends, the controversies, and the secret scientific tests performed on them behind closed doors.
" The countdown for the evolution of the human race has begun "
Sci-Fi Channel " The Mystery of the Crystal Skulls "
Thank you for visiting Richa ! I'm glad you liked what you read ... Will get in touch with you soon ! Actually microchips are 99.9% pure silicon found in beach sand. Quartz can be found in watches because when given a potential of electricity they can give a precise timing.